10/15/2014Share this story on Facebook! You may have heard the slogan "Ithaca is Gorges," but you need to see it to believe it. Ithaca is surrounded by natural beauty, including the Ithaca College Natural Lands, which celebrated their 10th anniversary this year. 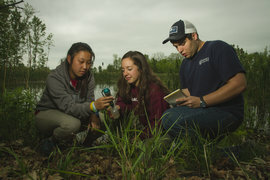 Associate professor of biology Leann Kanda and her students set up cameras with motion detectors in the Natural Lands for two weeks to monitor the wildlife using the trails. In this time lapse video you can see turkeys, deer, raccoons and a coyote. But blink and you'll miss it! Read more about her research project. 600 freshmen - the number of students who are taken to the Natural Lands each year as part of their first-year seminar.